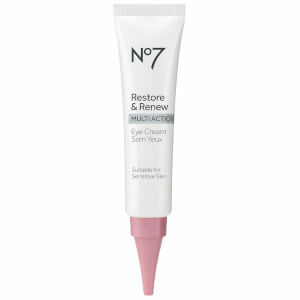 Reveal younger looking skin with the Boots No.7 Protect and Perfect Intense Eye Cream; an advanced formula that targets and minimizes signs of aging. Comfortably smoothing over the eye contour, the luxurious formula is especially developed to suit the delicate skin at the eye area. Utilizing No.7’s most concentrated peptide technology Matrixyl 3000 Plus™, the potent eye cream boasts the power to reduce the appearance of even deep lines and wrinkles. The formula also visibly diminishes dark circles and unwanted puffiness, to leave eyes bright and awakened. 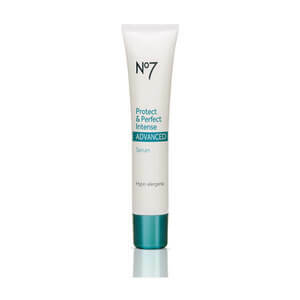 Boasting No7’s best antioxidant protection Double Defence technology, troublesome wrinkles are not only minimized, but skin is protected against environmental stress. The anti-aging eye cream is finished with a skin-loving blend of Glycerin and Shea Butter, which envelop the eye contour in a veil of nourishing moisture. Expect smoother and more youthful skin. Use around the orbital bone (the bone around the eye) for deeper lines and wrinkles. Aqua (Water), Glycerin, Cyclopentasiloxane, Butyrospermum Parkii (Shea) Butter, Cyclohexasiloxane, Cetearyl Alcohol, Polyacrylamide, Glyceryl Stearate, PEG-100 Stearate, Phenoxyethanol, Stearic Acid, Palmitic Acid, Alcohol Denat., Titanium Dioxide, C13-14 Isoparaffin, Butylene Glycol, Methylparaben, Laureth-7, Ethylparaben, Retinyl Palmitate, Sodium Polyacrylate, Sodium Hyaluronate, Ascorbyl Glucoside, Medicago Sativa (Alfalfa) Extract, Tetrasodium EDTA, Hesperidin Methyl Chalcone, Lupinus Albus Seed Extract, Potassium Hydroxide, Carbomer, Steareth-20, Phyllanthus Emblica Fruit Extract, Dimethylmethoxy Chromanol, Polysorbate 20, Ginkgo Biloba Leaf Extract, Manganese Oxide, Ethylhexylglycerin, Chlorhexidine Digluconate, Tocopherol, Potassium Sorbate, Dipeptide-2, Palmitoyl Tetrapeptide-7, Palmitoyl Oligopeptide.